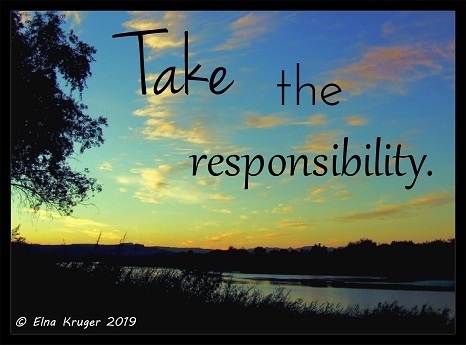 Is it easy for you to take responsibility for something? or not? Taking responsibility for what you choose, what you say, what you do and what you become is a big deal. It is not something to be taken lightly. Not taking responsibility for your actions seems to be the easier option in today’s culture of blame-shifting. It can always be somebody else’s fault, whether your parents, the government, the doctor, your boss, whatever – the point is, it’s easier to blame than to take responsibility. It also seems that some people are just the responsible type and others tend to be more irresponsible. So responsibility’s definition is not consistent for everybody, and its meaning seems to elude us somehow. But in this ezine I want to focus on the responsibility we as parents OUGHT to take when it comes to our children’s education. It amazed me the other day when asking a family member whose child is in school, whether they know what their child is learning at school and what type of qualification the child will get, that they did not know. They trust the school to deal with those decisions, and they trust the system, thinking they as parents will ‘know’ when there is a problem. This makes sense if they have a very good relationship with their child, and if the child often shares what he/she learns at school with them. But what about when this is not the case? In another situation I had to do with somebody who indicated they clearly do not want the child to be at home, because they just don’t want to have the ‘responsibility’ of educating their child. It seems that the default way of ‘taking your child to a place to be educated’ and in that action, effectively handing over the responsibility of his/her education to the school, is much easier and less scary for most people than actively taking responsibility for their child’s education. ·	Is it because of ignorance and a belief that the responsibility is too big? ·	Is it really because people are afraid of responsibility? ·	Is it because that way they can blame others if things do not turn out as hoped for? Part of taking responsibility is taking the blame for mistakes made. Is that too hard to do? I am not sure what makes people shy away from responsibility, but I do know that it is a very important conscious action one has to take when deciding to homeschool your children. You CANNOT home educate your children, but not take the responsibility. Ironically I have seen that happen – people saying they ‘homeschool their children’ but effectively not doing anything to help, empower or support their children to build a future for themselves. It does not matter what homeschool approach one uses, if you are not actively helping your children to eventually take responsibility for their own education, you cannot call it home education. Home education without responsibility is no education. And no education for your children is neglect of another sort. All of us will agree that physical neglect is a serious offense, but how many of us can recognize educational neglect? I am sure many of us has seen this before, as well as the effect it has on the children. It is sad to see, as I’m sure you will agree. So what do want to see? Parents actively taking responsibility for their children’s education and not being afraid of it. This does not mean helicopter parenting, or overprotecting your children or any of those funny things involved parents sometimes get accused of. It does mean you know what your child is learning (whether in school or at home) and you know what he/she is learning about, from whom and from what perspective, with what agenda. It also involves supporting your child in a way that he/she can take responsibility for building a future for themselves, including getting a qualification of some sort. In today’s world there is no such thing as a NEUTRAL EDUCATION, so one can never assume that content is written from a neutral perspective with an honest sharing of facts. Know what your children are learning, and see whether you agree with that. My oldest is currently busy with tertiary studies, and not one of her textbooks are neutral, whether it relates to biology, chemistry or even business management. Everything has a perspective that is biased and we need to train our children to be able to recognize it as such. In this way they will be able to analyse information accurately and know that there are always different sides to a story or perspective. If you do not take responsibility for your child’s education and he/she also does not, the result will usually be a lot of time wasted. Now I do believe it is always possible to catch up later when something did not happen when it should have, but if this happened over many years, then it may take very many years to catch up. I also firmly believe that part of this parenting responsibility is to teach/train our children to be responsible themselves, especially in the later years. During the high school years, children need to be involved and responsible for their own education and later a qualification to support their career goals. Achieving this shift in responsibility is not as easy as it seems. That phase where a child needs to start taking responsibility for their own education is not necessarily achieved smoothly or automatically. It is a gradual shift, an active process with definite intentions and clever strategies as each child differs in how ready they will be to want to take responsibility. But again, just because something is challenging, do not shy away from the responsibility – one day you will look back and be proud of your children as they have grown into mature young adults also taking responsibility for their own education, their own careers and lives. For those young ones eager to read and write, get Omvattend Afrikaans for a complete Afrikaans Foundation phase programme. Nothing else is as comprehensive, guaranteed to teach reading and writing Afrikaans effectively. And thinking of getting creative? Get the South African Art series for Children where you can explore artists and their work? You cannot lead anyone else further than you have gone yourself.